A couple of months ago I was invited by veteran VA Sharon Williams of The 24 Hour Secretary and OIVAC to join a committee comprising other veteran VAs from around the world to discuss updating the Core Competencies we had worked on back in 2004. The other members are also veteran VAs, having been in the industry over 12 years – some more than 20 – and who run groups or associations. 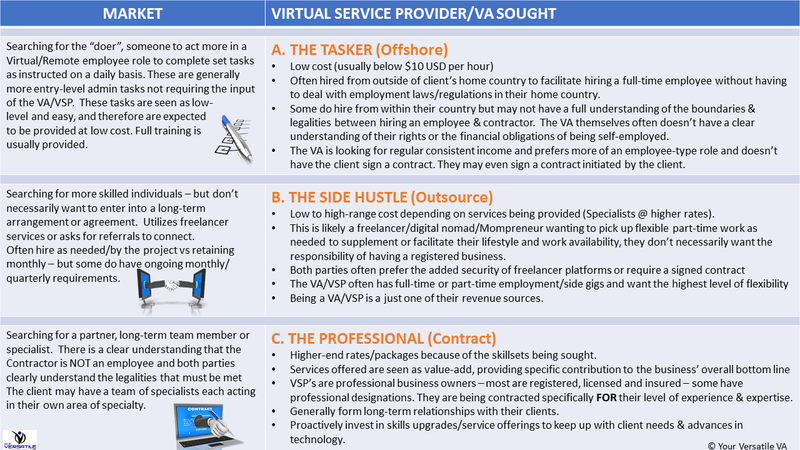 We had all seen a trend in emerging VAs where the industry seems to be turning into something you do to fill in time between childcare duties, or a side hustle to your full-time job. It used to be that you aspired to being a VA full-time – and your job became part-time while you built your practice. However it looks like now, many newbie VAs view the industry as a hobby, and this can have very detrimental effects on those of us who have worked very hard, for a very long time, to build the industry into a reputable, legitimate business option. Since I began my VA journey back in 2000, the industry has certainly evolved and changed significantly. What back then was a fledgling industry based on a new concept, and forged primarily by women* who had come from years working in administration, secretarial, PA or EA roles, has grown and developed into a truly global industry with many industry associations meeting the needs of individuals who want to build truly successful virtual assistant practices. However on the flip side, the growth and accessibility of the internet globally has also seen an increase in the number of get-rich-quick schemers, those not wanting to have a business but something to supplement their full-time job, those who can ‘work the internet’ or have a social media presence so that makes them an ‘expert’ in social media management, and those who think we are all call centre operators in India. These days, many new entrants to the industry have no background in admin at all – some are coming direct from school looking for alternatives to traditional employment. Many of them already have tech skills. They’ve grown up with technologies and apps they take for granted that didn’t even exist when we first started our practices. The internet was fledgling, social media was unheard of, and mobiles were a box the size of a brick in your car. When you’re looking for a VA you need to realise that not all VAs are alike. You need to be very clear on what it is you are looking for. It used to be that you were looking for help with your administrative tasks on a regular basis to help with the overwhelm and enable you to focus on your core income generating activities; a partner with a vested interest in the success of your business. Or you may have been looking for someone who could help with a particular project, or someone who had skills your in-house staff lacked. As such you’d be looking for someone who had the time necessary to devote to your needs, who had experience in not only an administrative capacity but also working remotely. But today, with so many different types of VA popping up clients need to be very clear what they want and need – otherwise you run the risk of partnering with the wrong VA entirely. Remember that anyone can say anything these days. When it comes to marketing the adage “it’s better to ask forgiveness than permission” appears to be being applied to newbie VAs with many on discussion boards admitting they have little to no experience in a given service, but that they want to provide that service to clients; that they have no training and asking how they can start offering the service to clients ‘now’ – a ‘fake it till you make it’ mentality instead of getting ducks in a row before they go out there offering their services to clients. This makes it even more essential for clients to do their homework. Whilst a VA is not an employee you should approach the decision about who you partner with in a similar way. Do your research. Speak with them. Look at testimonials and go to the trouble of contacting the provider of those testimonials. Easy enough to fake a testimonial these days – especially when it seems what’s regarded as “the truth” is quite flexible. Testimonials are not the same as work references – if you’re looking for a VA with experience in offering the service then someone with what looks like work references in the testimonials section of their site is a an indication they’ve not been in business long. This still might be the right partner for you, but you need to be aware of the difference. Similarly, you wouldn’t ask a VA for a CV or résumé. You’re not looking for an employee but a partner in your business success. And if it doesn’t work out, don’t give up on the industry entirely. You may just have picked the wrong partner. There is no doubt that the VA industry provides a level of flexibility in work and lifestyle that many people have been seeking for years. However being a VA is NOT for everyone. First and foremost, if you want to do this full-time, you will need to understand you are a business owner, not an employee which can be a massive shift in mindset – not just for the VA but for potential clients too. If you are only after a bit of extra cash without the hassles of running a business too, or if you are working full- or part-time and you want to keep it that way, having your VA work supplement your income, then understand you are not a VA practice, but more likely a hobbyist – and that’s okay but please don’t promote yourself as a professional VA, and make sure any clients who come to you understand that you are not a full-time VA practice. Be authentic – because clients need to know who they’re working with. If they’re looking for someone who is going to partner with them consistently, then your model isn’t it and you should be redirecting them to professional VA services. If you’ve just discovered the VA industry and are thinking this might be a great alternative to traditional employment – it is. But also get clear in your own mind what it is you want: to be a business owner; or to make some extra cash. If you have no experience at all in office environments then think hard about the services you want to offer. If you decide you want to specialise in an area like social media – just having a Facebook account and knowing your way around Twitter or Pinterest doesn’t mean you’ll be a great fit for client’s looking for a social media manager. If you have never run a business before and have no clue where to start you need to understand being a full-time VA IS being a business owner. This does NOT mean that you should give it up, but in today’s ‘instant gratification’ environment with its ‘I want it NOW’ mentality you need to shift your mindset and realise it’s going to take time to build your practice. You can’t lie your way to success. According to the Small Business Association about 30% of new businesses fail during the first two years; 50% during the first five years; and 66% during the first 10. You can’t be a business owner part-time. You can have a part-time business – but again, that’s a hobby. If you love your job fantastic!! Stick to that. If you want to run a successful VA practice, that means making changes to how you perceive work. Previously I’ve said that I didn’t think it was necessary for those wanting to become a VA to do training. However with this new stable of potential VAs coming from zero experience and some straight from school, getting training in what’s required would be an excellent starting point for them. There are many people out there offering training – how to be a VA, how to get started, training in specific niche areas – but you need to do your due diligence on them too because just like there are many types of VA who may or may not meet the needs of the client, there are many types of trainer and you need to be sure the one training you knows what they’re talking about. Great post Lyn and I could hear your voice while reading it! Love the graphic at the top. LOL … Yes I do tend to write as I speak 🙂 Thanks Kathie! Excellent post! Thank you for this! Great article, right on point! I will share it across my platforms. Thanks Sharon! That would be awesome!